Currently I got back to using my all time favourite foundations. I love using both during the colder months. 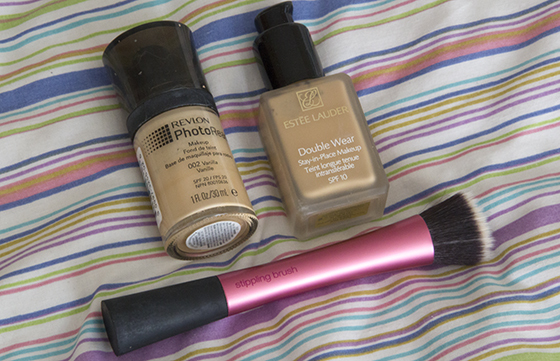 I had mention before that foundation are my favourite beauty products to try out. Revlon Photoready is one of my favourite foundations. The colour match is amazing, great for my pale skin. It does contain the small glitter particles, but I don't really mind them. In my opinion the coverage is light, but buildable. It's very lightweight on the skin, doesn't leave your skin feeling sticky. The Estee Lauder Double Wear have medium to full coverage. I'm not the biggest fan of matte finish when it's comes to foundation. Double Wear has matte finish and if you apply too much it will be very cakey. What I like to do is mix both foundations together, then I get the most perfect finish and coverage. I normally use one pump of each and then mix it on the back of my hand. Then I reach for the Real Techniques Stippling Brush, recently I started to love using it to apply foundation. Before I only used it for cream blushers. My second technique to apply both foundation is to dot the Photoready on my forehead, chin and around the nose. Then dot Double Wear on my cheeks and nose. Blend everything together and it still worked for me. I'm still looking for the perfect foundation, there are so many I want to try. What foundation do you like to wear? Is it just me that chooses what foundation I use for winter and which I use for summer? i like revlon colour ready too but find it a bit too heavy for me. i like rimmel 25 hour foundation and collection 2000 foundation, but lately i have been loving bb creams :) they're so much lighter and give me the right amount of coverage i need!